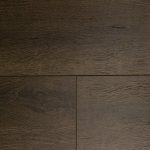 Armstrong Audacity Water Resistant Flooring Information | Floors, Flooring, Carpet and More! Armstrong Audacity is a line of water-resistant laminate flooring from Armstrong that is super durable and super easy to clean and maintain. Armstrong Audacity has the latest designs and delightful embossed-in-register surface for a real wood texture and feel. 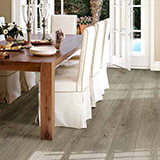 withstand spills and pet accidents and keep the Armstrong Audacity laminate looking great! Along with being water-resistant Audacity is also extra stain, scratch, and impact resistant. 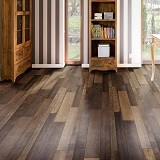 Audacity laminate floors have an extra stain resistant layer AND can be wet mopped. -Can be installed over 300% larger areas than traditional laminate floors without unsightly transition strips – Up to 4000 ft! –Deep synchronized surface for a more natural and authentic wood look & feel. The Armstrong Audacity line of water-resistant flooring at American Carpet Wholesalers is made up of 4 separate collections. The Classic Naturals with Antarctic, Charleston Gray, Homestead Brown, Mountain Gray, and Oslo. Tight Lock Click System: 5X the contact points vs standard laminate, helping to seal out moisture. Classic Naturals, Hearthside, Vintage, and Lodge. These make up an additional 11 styles/colors with a wide range of finishes available. How is Armstrong Audacity constructed? 5. The fifth later is a pre-attached 2mm pad, providing additional comfort and sound absorption. This also means you don’t need an additional underlay. Armstrong Audacity is also safer in regards to air quality, is easy to install in homes and is a FloorScore certified product. Formaldehyde is a naturally occurring substance not only in all wood, formed by elements found in our environments like carbon, hydrogen, and oxygen but also at low levels, usually less than 0.03 parts per million (ppm), in both outdoor and indoor air. While formaldehyde is naturally occurring, high levels can be harmful to humans. All Armstrong Audacity floors are subjected to rigorous tests that are designed to ensure that all products abide by the highest standards and do not harm indoor air quality. This makes our floors safe for you and your loved ones. Armstrong Audacity has taken steps to obtain certification of its claims by a third party, the FloorScore. It is an industry-independent organization that aims to protect human health by enhancing indoor air quality and reducing people’s exposure to pollutants by certifying products for extremely low chemical emissions. With its rigid core and a convenient tap down click system, Audacity flooring is easy and fast to install, and thanks to floor’s rigidity, it only requires a minimum subfloor preparation (subfloor should be leveled to 3/16” / 5mm within a 10ft / 3m span). A do-it-yourselfer can click together a living room size floor in about a day, and start enjoying it immediately. To learn more about the Armstrong Audacity laminate Flooring available at American Carpet Wholesalers give us a call at 800-548-2706. 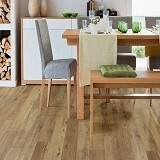 Our flooring experts will be able to explain the full benefits of this water-resistant laminate plank floor. Plus, when you call we can ensure the best deals for your project. Click here for more reviews of the Laminate Flooring products available at American Carpet Wholesalers or Click here to explore other styles of flooring. For more on American Carpet Wholesalers check out the customer submitted reviews on Reseller Ratings.